"Tell the judge I love my wife." That's a heartbreakingly beautiful quote from Joel Edgerton in Loving, one of the year's best & most powerful films. The film is based on the true story of Richard & Mildred Loving, an interracial couple who were involved in the 1967 court case Loving v. Virginia, which declared interracial marriage bans to be unconstitutional. 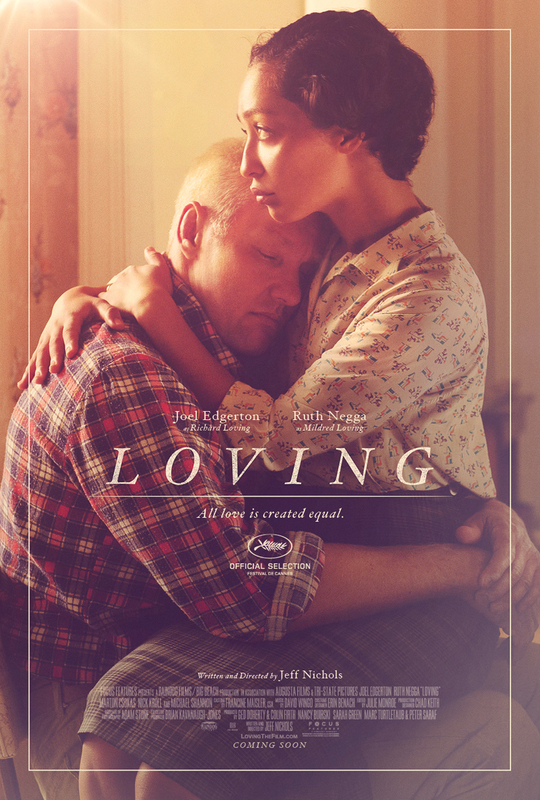 Set in 1958 Caroline County, Virginia, Edgerton plays Richard Loving, a white man, who when his girlfriend, Mildred Jeter (played by Ruth Negga), a black woman gets pregnant, they decide to get married in Washington, D.C., because Virginia is one of 24 states in the country at the time that has banned interracial marriage. After their marriage in Washington, D.C., they return to Virginia, where Richard builds a house for him, Mildred, & their child just a few blocks from Mildred's family home. One night, in their sleep, the police raids the Lovings' home & arrest them both. Richard points to their marriage license, but it is not valid in Virginia. They plead guilty & are sentenced to one year in prison, but their sentence is suspended provided that they cannot return to Virginia for 25 years. Because of this, they move to Washington, D.C. to live with an old friend of Mildred's. However, they return to have Richard's mother, a midwife, deliver Mildred's child; once again, they are arrested, but are freed again after their lawyer reveals he told them they could go back. After returning to Washington, D.C. with their three children, Mildred becomes disillusioned with living in the city & longs for returning to the countryside, so she writes a letter to then-Attorney General Robert F. Kennedy, who refers her to the American Civil Liberties Union (ACLU), who then asks lawyer Bernie Cohen (played by Nick Kroll) to take the case. Cohen quickly concludes that the case could go to the Supreme Court, & it could overturn all interracial marriage bans across the country. On Cohen's advice, Richard, Mildred, & their three children quietly return to Virginia in a rural area of King & Queen County. The case gains wide attention, namely from Life magazine, who sends photographer Grey Villet (played by Michael Shannon) who comes to take pictures of the Lovings for the magazine. This gives more attention to the case, & in 1967, the Supreme Court, in a unanimous landmark decision, decided in favor of the Lovings, declaring interracial marriage bans to be unconstitutional. A post-credit reveals that only eight years after the case was decided, in 1975, Richard Loving was killed in a car accident by a drunk driver. Mildred never remarried, & continued to live in the house that Richard built for her until her death in 2008. In an interview shortly before her death, Mildred said this about her husband: "I miss him. He took care of me." The cast is spectacular, with Edgerton & Negga possibly receiving Oscar nominations for their performances, & Kroll excelling in a dramatic performance, in a huge departure from his comedic roles on TV series such as The League & Kroll Show. Jeff Nichols' direction & screenplay is amazing, solidifying his place as one of the best directors of the 21st century after directing films such as 2007's Shotgun Stories, 2011's Take Shelter, 2012's Mud, & 2016's Midnight Special. This is the most important film of the year.